A one year old, castrated male, domestic shorthaired cat presented following a 10 day history of lethargy, anorexia, decreased water consumption and appearing uncomfortable. Initial bloodwork revealed hypoalbuminaemia, leuocytosis, and neutrophilia. He tested negative for FeLV and FIV. On initial presentation he was quiet, alert, and responsive and had pale mucous membranes. He had a distended abdomen and a fluid wave was detected. Abdominocentesis yielded a yellow viscous fluid with a total protein of 4.6 g/dl and nucleated cell count of 2500 cells/µl with 90% segmented neutrophils. The cat was euthanised due to a poor prognosis, and a postmortem examination was performed. 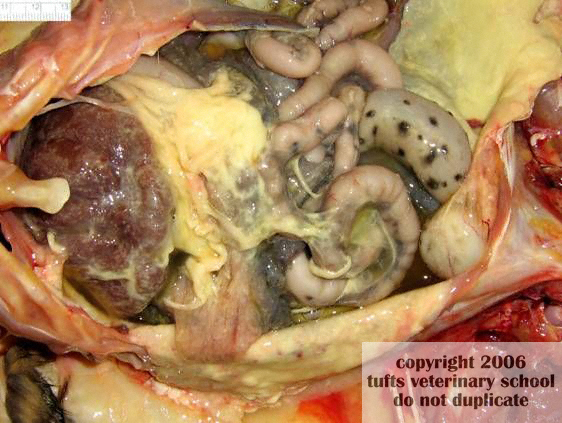 Gross findings were most prominent in the abdomen (see attached photograph). What is the cause of these lesions? What are the histologic features of this? The abdominal cavity contains a small volume of orange yellow fluid, and the serosal surfaces of abdominal viscera are covered with a large quantitity of yellow material (fibrin). This material forms strands and plaques that produce adhesions between adjacent viscera, as well as forming adhesions between viscera and the overlying parietal peritoneal surface. Microscopically we usually find that serosal surfaces are expanded by fibrin and a mixed population of inflammatory cells. This inflammatory component can vary and may comprise a combination of lymphocytes, plasma cells, macrophages or neutrophils (often degenerate with pyknotic nuclei). Typically such inflammatory foci are venulocentric: the inflammatory cells will surround venules or other small blood vessels that typically have necrotic walls that are invaded by neutrophils. Feline infectious peritonitis is caused by a coronavirus (FCoV) (enveloped, positive-stranded RNA virus). There are many strains of feline coronaviruses, and those that cause mild diarrhea are called Feline Enteric Coronavirus (FECV). Strains that cause FIP are considered to be a form of FECV that has mutated into the lethal FIP virus in the affected cat. In this disease there is formation of immune complexes which deposit in the vasculature causing vasculitis. The disease thus presents either as the “wet” or effusive, acute form (where affected blood vessels become “leaky”, with subsequent transudate formation), or the “dry”, non-effusive, more chronic form. FIP is a difficult condition to diagnose clinically, and presently the only accepted definitive diagnosis of FIP requires biopsy of affected tissues obtained at postmortem examination or from a surgical biopsy. FCoV antibody titre: Most cats with FIP have extremely high antibody titres (1280 or greater). The presence of FCoV antibodies alone is not diagnostic of FIP – it must be remembered that healthy cats and cats with other conditions may have FCoV antibodies. So if other clinical parameters are within normal limits, FCoV antibodies alone do not indicate a diagnosis of FIP. Total protein and albumin:globulin ratio (A:G): Cats with wet FIP usually have an effusion with a total protein concentration greater than 35 g/l. This is frequently composed of more globulin than albumin, reducing the A:G ratio (in dry FIP the globulin concentration in serum or plasma exceeds 40g/l). An A:G ratio of < 0.4 indicates FIP is likely, whereas an A:G ratio of >0.8 rules out FIP. For ratios in between, other clinical parameters must be considered. AGP is an acute phase protein, and although non-specific, it is a useful aid in making a diagnosis of FIP. Its normal levels in cats may be up to 500 mg/ml, but in FIP these levels usually exceed 1500 mg/ml. In cats with abdominal or pleural inflammation and effusion of other origins, AGP levels may also be raised, and hence cytology of the effusion is also useful to differentiate these conditions. In cases of cardiomyopathy, non-infectious liver disease and tumours (conditions most frequently mistaken for FIP), AGP levels are normal. Haemogram changes in non-effusive FIP consist of lymphopaenia and non-regenerative anaemia with a haematocrit of 30% or less, and often neutrophilia with a left shift. One important event in the pathogenesis of FIP is the infection of monocytes and macrophages. Avirulent FECVs mostly remain confined to the digestive tract and usually do not spread beyond the intestinal epithelium and regional lymph nodes. FECVs can enter the bloodstream but do not replicate in blood monocytes. Virulent FIP virus, however, leaves the digestive tract, enters the bloodstream, replicates in peripheral blood mononuclear cells, and travels to different organs via infected monocytes. A laboratory at Auburn University in the USA has developed a quantitative PCR test to target subgenomic mRNA of the M gene of feline coronavirus with high sensitivity. This PCR test specifically detects and quantifies the replicating virus as opposed to only detecting the presence of viral genomic RNA that may or may not be associated with active viral replication. This PCR test detects mRNA of the M-gene of all known feline coronavirus strains in any sample; however, for diagnosis of FIP, only the detection of mRNA in blood is indicative of FIP since active replication of the virus in circulating mononuclear cells is typical for FIP. In contrast, avirulent feline coronavirus strains replicate in the intestinal tract, but not in blood mononuclear cells. Subsequently it is considered to diagnose FIP with very high specificity. Hartmann K (2005): Feline infectious peritonitis. Vet Clin North Am Small Anim Pract, Jan;35(1):39-79, vi. Review. Simons F et al (2005): A mRNA PCR for the diagnosis of feline infectious peritonitis. J Virol Methods, Mar;124(1-2):111-116.